While I found our travel guidebook, Let's Go: Europe 2011, somewhat disappointing in a few aspects, its suggestions on where to go for a drink never let us down. 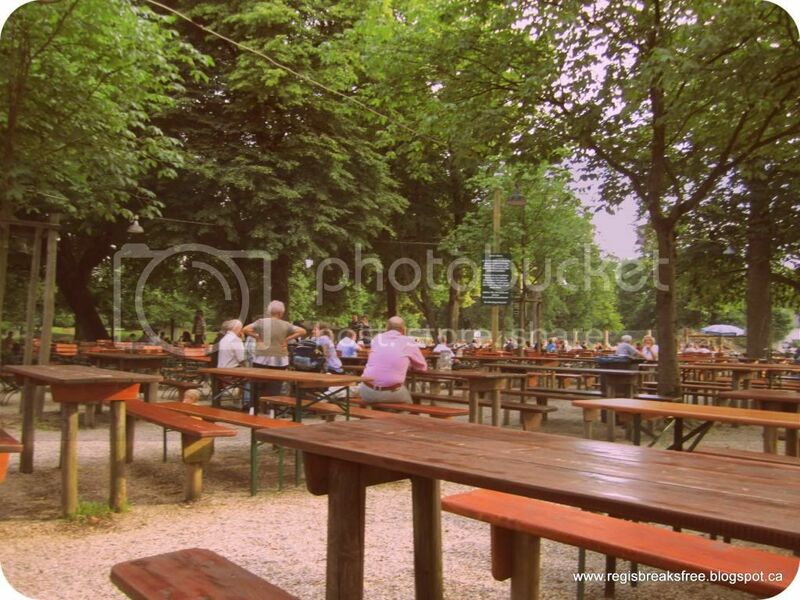 We couldn't possibly visit Munich without a visit to a local beer garden, and what better place to go than the largest beer garden in the fricken world! 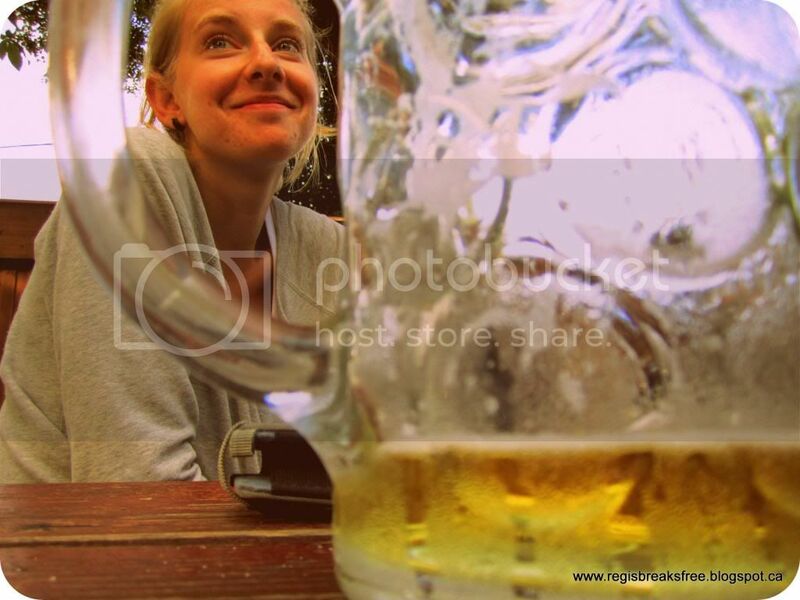 That's right my friends, at 8,000 seats the Hirschgarten Biergarten is one heck of a place to grab a pint...er litre...or whatever those huge mugs hold. 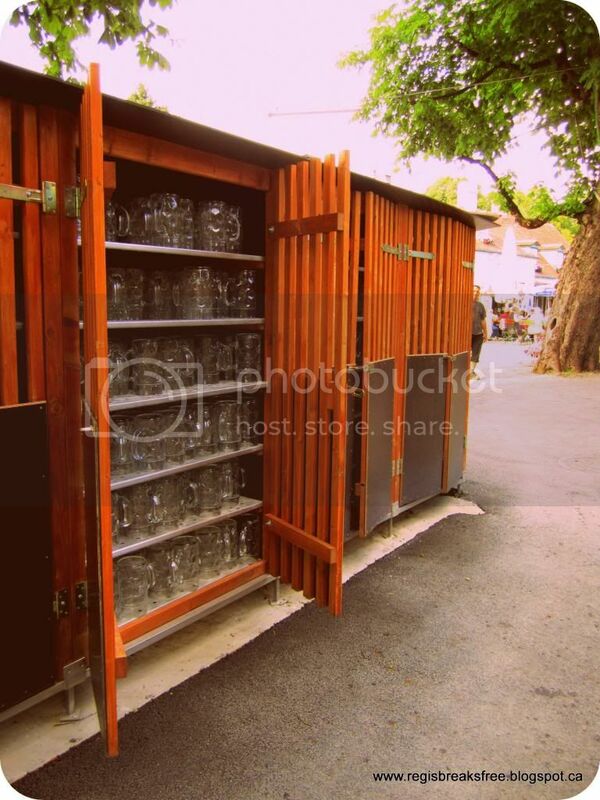 Step right up and pick a glass! The atmosphere was casual and relaxed, as a beer garden should be, and we felt like the only tourists there (though that's probably because not all tourists wear tshirts that make it glaringly obvious). It was so relaxed in fact that we weren't sure we were in the right place until we saw these beer mugs. There wasn't a lot of signage, and it took us a while to figure out a plan of attack, but eventually we got in line at a concession-like building and got ourselves some huuuuuge plates of delicious, sizzling food. And a pretzel. One of the most amazing meals of my life. The beer was in a second line, where the barman is literally pouring the golden foaming Augustiner into those huge glasses as fast as he can, and the line just keeps coming. It was about 6.60EURO/glass, and it was the best beer I have ever tasted. And I don't even like beer. Fun fact: apparently the beer garden is located next to a deer garden (hee hee). As in, there is a park full of deer on the other side of the fence! Let's Go did not mention this, so we had no idea Bambi & co. were nearby, but hey- being from BC, its not like we have never seen deer before. That was a lot of beer. However, being from BC, we did experience the novelty of seeing all ages in the beer garden. And by all ages I mean everyone from old grandmothers right down to mischievous toddlers. Yes, this beer garden is quite literally a kindergarten, a garten of kinders. It was quite weird to see the WHOLE family in a beer garden, but then again it just felt like a big park too. 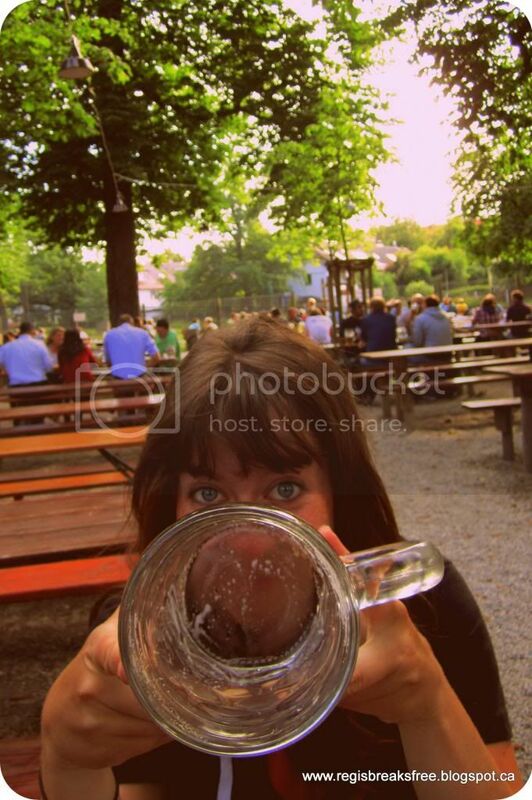 My research leads me to believe that it is traditional for visitors to wash their own beer mugs at Hirschgarten, but once again Let's Go! dropped the ball on giving us the inside info, and we definitely didn't complete this task. Besides, we saw this guy driving around and I wouldn't have liked for him to feel superfluous. Ps. check out that hair. After enjoying our perfectly wonderful dinner and beer, Brit and I giggled our way back to the bus stop and eventually found our way back to the hotel. 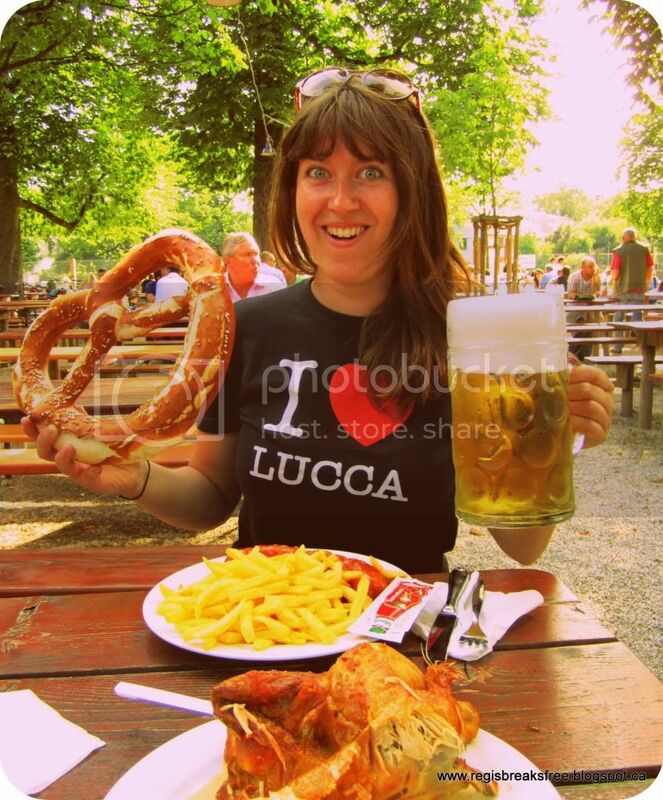 It was a great day and a lot of fun, and I when I think of Munich I will always remember that exceptionally perfect pretzel and the only beer that ever made me want to be a regular at a beer garden. 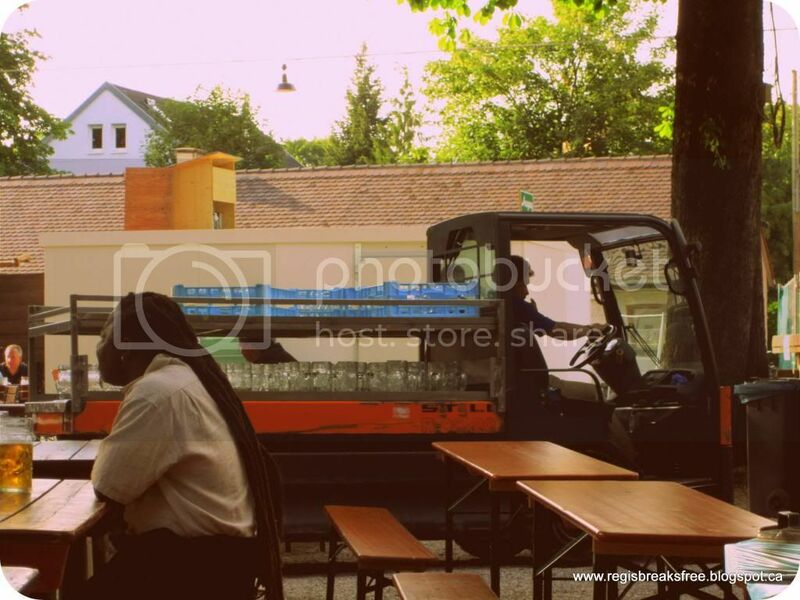 To this day I can't guarantee that I wouldn't forsake my gluten-free ways if I were back in Munich just for another evening spent in Hirschgarten.